In Britain, venison has often been seen as exotic, a rich man’s alternative to beef, probably because of the relatively short supply. Venison only came to market as a by-product of wildlife management and hunting. Farmed venison is now widely available, and is of reasonably good quality, but the wild varieties provide the finest quality, and it’s the wild type you should aim to cook with. Thanks to a baby boom in the wild population, supply isn’t a problem, with deer hunted for most of the year, with the exception of March. The Roe is a small animal, native to much of Europe, standing just under a metre tall with a beautiful red coat in summer, darkening to grey or black in winter. It’s meat is dark, with the distinctive red tinge characteristic of venison. The meat will have been hung for at least ten days and probably closer to a fortnight to let it mature and for the flavours to intensify. In cooking, it’s treated in much the same way as beef. For a 750g roasting joint, you’ll need to season well with salt and pepper, then seal the meat thoroughly in a hot frying pan that can go in the oven. There will be much spluttering and spitting, and a pair of long handled tongs are essential. When the meat is browned on all sides, transfer to a hot oven (200 or 210c) and roast for about ten or eleven minutes for a rare joint, maybe fifteen minutes for a more well done roast. Test the doneness of the meat by squeezing it gently – rare meat will feel a little spongy, whilst medium and well done will be firmer. If you get to the well done stage, you’ve failed. 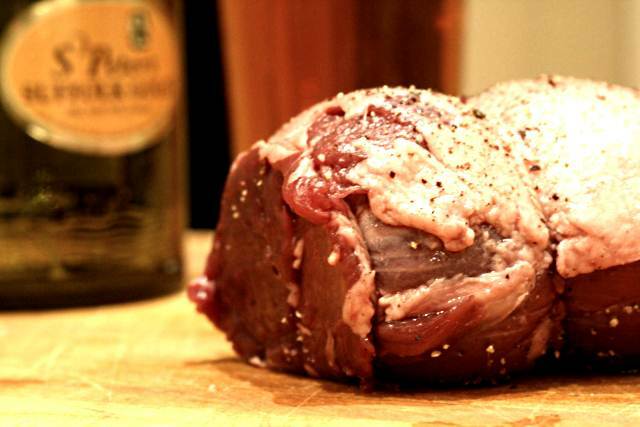 Venison is quite lean and does not tend to have fat marbled through the flesh in the same way that beef does. To counter this, either roast the joint quickly and leave to rest for longer than normal or wrap the joint in streaky bacon in order to add extra fat and to protect the meat. I prefer to simply roast quickly on a high temperature. Remove the pan from the oven, and place it somewhere safe with the handle pointed firmly away from you. Countless times, I’ve taken a pan out of the oven with oven gloves on, done something else, forgotten about the handle and grabbed it with a bare hand, leaving a sore welt and an atmosphere laden with expletives. Left handed typing for at least a week. Loosely wrap the joint in foil and leave to rest for about ten minutes. The resting is vital. It allows the meat to relax and for the juices to be absorbed back into the roast. To make a quick sauce, deglaze the roasting pan with a glass of drinkable red wine and add a couple of teaspoons of redcurrant jelly, along with salt and pepper to taste. Reduce quickly and finish with a small knob of butter to give the sauce a shine. Serve with parsnips, parboiled for about four or five minutes and roasted in hot olive oil with a clove or two of garlic. 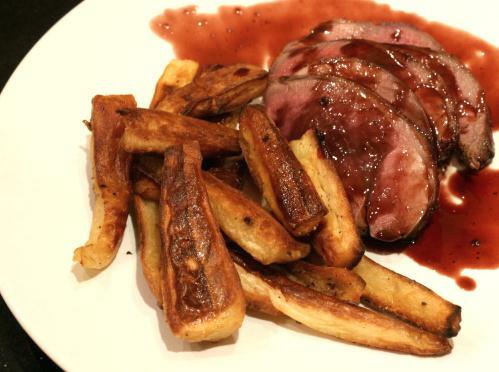 Try The Wild Meat Company for excellent venison.